For many companies, total cost of ownership (TCO) is out of control. And the problem is growing, fueled by ever-increasing demands from the user community, massive new sources for data, new capabilities, shadow itland-scapes, and the cost of keeping people abreast of all the changes. 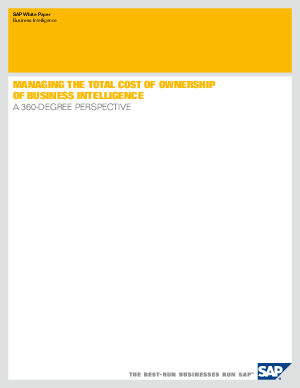 The purpose of this paper is to focus on developing a framework for monitor-ing and managing the total cost of ownership of business intelligence.